Usually, I share my experiences making other people’s recipes, but this week I’m using my own recipes for my two favorite kinds of oatmeal. Most people eat oatmeal for breakfast, but I love savory apple, cheddar, and rosemary oatmeal for lunch. This is actually a copycat recipe. Quaker included this flavor in their Best Bowl Competition boxes, but I’ve never seen it (or the other flavors in the running) in stores since the end of the voting. Therefore, I decided to make my own, less artificial-tasting version. I top it with eggs over easy to add some protein and a creamy “sauce” thanks to the yolks. There’s also some great texture from the chunks of real apple. All in all, this dish satisfies without being heavy. The second way I prepare oatmeal is with peanut butter and cocoa powder for an indulgent but not overly sweet bedtime snack. I’m nursing a hungry infant, so my body appreciates the slow-digesting protein and fiber at night. The combination of chocolate and peanut butter also helps curb my tendency to snack more than I need to before bed. Each recipe works at any time of day and yields 1 serving. Enjoy! Put the oatmeal in a bowl and season with salt and pepper. Combine the juice, apples, and rosemary in a small saucepan. Bring to a boil and boil 2 minutes. Use a spoon to keep the apple chunks in the saucepan while pouring the liquid into the oatmeal. Let sit for 1 minute, then add the apples and shredded cheddar. Top with eggs cooked to your preference if you’d like to add some protein. Boil 1/3 cup water (or a little more or less depending on the consistency you prefer for your oatmeal). Meanwhile, pour the oatmeal, cocoa powder, and brown sugar into a bowl. Stir in the boiling water and let sit for 1 minute. Add the peanut butter and stir to incorporate. Top with chocolate chips if you’re using them. The Try It Tuesday recipes have been rather sweet lately, so I decided to indulge in pasta that doesn’t have red sauce for lunch since my husband wouldn’t be home to complain and my son always eats peanut butter toast with gusto. Not only was I ready for something different from my usual lunch time fare, but I also have canned tuna that only I will eat. I flipped through some magazines and researched pesto recipes online, then I combined a few recipes to come up with this Tuna Pesto Pasta. This yields 2 servings. Boil the pasta according to package directions or according to your preference (I generally only cook my pasta 8-9 minutes). Meanwhile, drain the tuna and put it in a medium bowl. Set aside. Put the basil, salt, pepper, garlic, and almonds into food processor. Process until finely chopped then add the olive oil and two tablespoons of water while the processor is on. Pour the mixture into the bowl with the tuna. Drain the cooked pasta, reserving some of the cooking water. 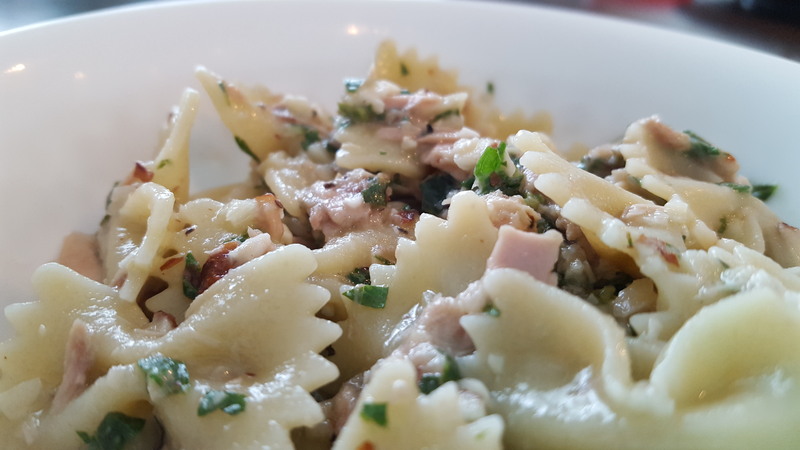 Fold the pasta into the tuna and pesto; add cooking water a little at a time, stirring gently between additions until the sauce coats the pasta to your liking. I tend to use a little less water than recipes suggested. I really enjoyed the freshness of the pesto and between the almonds and tuna I felt like this packs a protein punch. I also love the ease of prep: no time-consuming chopping and I think this was ready in under 15 minutes. I may have to try other versions of pesto and replace the tuna with canned chicken or turkey to see if I can’t get my boys (a.k.a the hubby and preschooler) to try it. As I was eating, the only thing I’d consider changing for my own taste buds would be to add some quartered cherry or grape tomatoes. I am not a tomato person, but every now and then, the sweetness and acidity of the smaller varieties are a welcome shot of flavor and color in a dish. I’d love to hear your thoughts on this recipe since this is the first time I’ve made pesto. Otherwise bon appetit! My mother-in-law and I bond over cooking shows. We both enjoy baking and talking about what we would make in the contestants’ place. In our discussions, we keep coming back to macarons. While I’ve eaten many macarons, I have never made them… until yesterday! 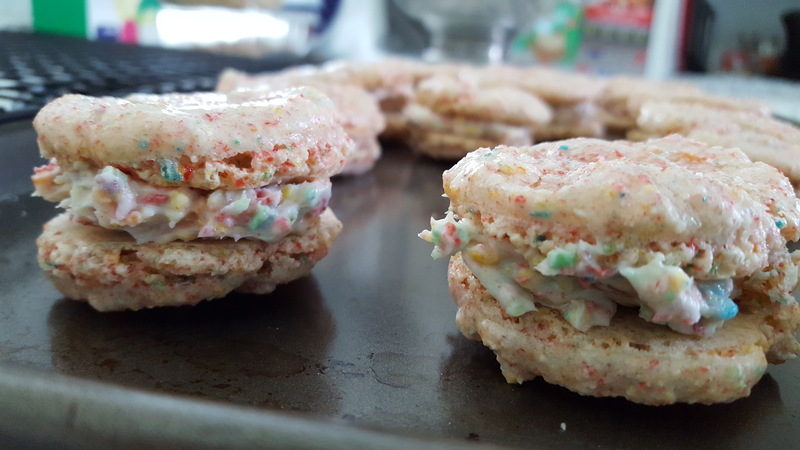 A few weeks ago I happened across a recipe for Fruity Pebbles macarons. As a kid, I loved this cereal and this recipe finally motivated me to get the ingredients (and a kitchen scale) to make them. This week, my in-laws came to visit and my mother-in-law and I had our time in the kitchen. For a first try, I’m pleased with how our experiment turned out. The shells had the distinctive, chewy macaron texture. The outside didn’t puff up quite like macarons are supposed to, but I don’t think I got the Fruity Pebbles quite as finely ground as I needed to. The flavor conjured up memories of Saturday morning cartoons and cereal on the living room floor. However, this version of macarons was a tad too sweet. Even my preschooler couldn’t finish his cookie. Perhaps these just need to be made into mini macarons. If you’re interested in trying the recipe, it’s in a cook book called Cereal Sweets & Treats by Jessica Sergarra. I’ve heard time and again how delicate a difficult macarons are to make, but my mother-in-law and I had fun making these. Despite the attention and precision called for by macarons, I’d be willing to try them again. Next time around, I’ll try more traditional flavors for my macarons: almond shells and chocolate or cherry filling, perhaps? 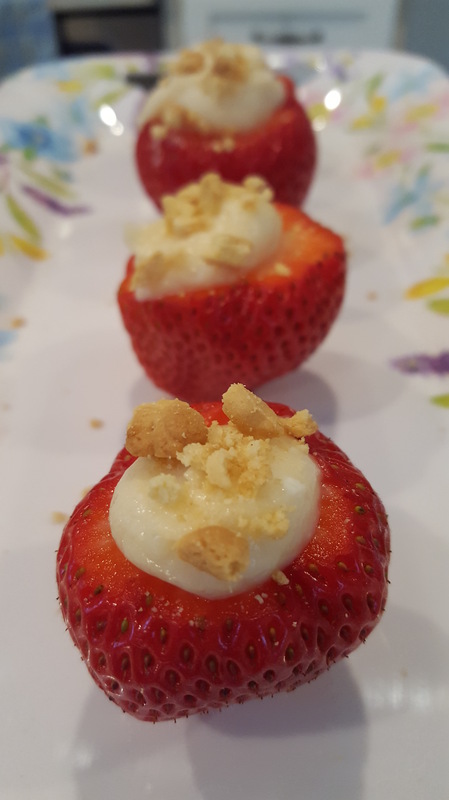 I saw some beautiful, large strawberries at the grocery store today and immediately thought of a video I’d saved a while ago on Facebook: No-bake Strawberry Cheesecake Bites. I couldn’t pass up the chance to use these berries. I followed the directions exactly as given in the video. They turned out great! Don’t let the name fool you, though; these are not filled with cheesecake. They are filled with cream cheese icing. Even still, they are not overly sweet and the vanilla compliments the flavor of the strawberries. The only caveat I have is that this recipe wouldn’t work well if the berries aren’t perfectly ripe. 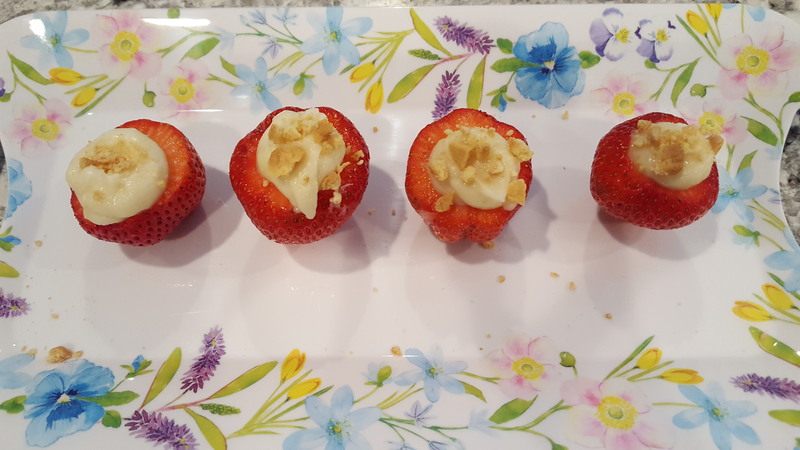 If you find perfect strawberries like I did, enjoy these perfect bites of summertime sweetness. Oh, it’s obvious I’m still getting back on the swing of things; I forgot that yesterday was Tuesday so I didn’t post. This is a recipe from November during my first few days in our new house. I had limited cooking supplies. Just to drive home this point, I mixed up the batter for these in a large saucepan, not a mixing bowl and I mashed the bananas by smushing them between my fingers. I now understand why babies who are learning to eat big-people food find it so fun to squeeze everything between their little fingers. Preheat oven to 350 degrees Fahrenheit. Line a jellyroll pan with parchment paper. Put all ingredients except the chocolate chips into a mixing bowl and stir until well combined. Fold in the chocolate chips. Pour the batter into the prepared pan and bake in preheated oven for 18-20 minutes. These bars have a light, cakey texture and a subtle banana flavor. They are a great snack with a glass of milk or even a good breakfast food that can be served next to yogurt or spread with peanut butter. Of course, my son loved this sweet treat and although I prepared these by myself, the banana chocolate chip bars would be a great way to bake with small children because of the simplicity of the recipe. Enjoy both the making and the munching of these deliciously simple little squares! 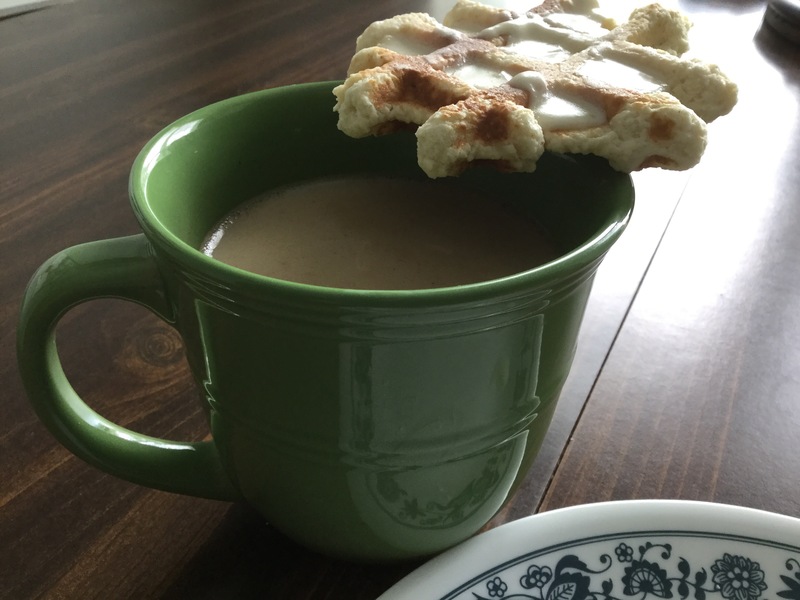 Old-Fashioned Sour Cream Doughnuts… In a Waffle Iron! In case you’ve missed the promotions at your neighborhood doughnut shop, it’s National Doughnut Day. Since I had some sour cream left over from a tasty corn hot dish (think casserole or spoon pudding) I made last week, I decided to try a recipe for sour cream doughnuts. These are possibly my favorite variety. I definitely prefer cake doughnuts to yeast, and I find traditional glazed and powered sugar doughnuts overly sweet. There was only one immediately apparent problem with the recipe: it called for frying. If you’ve read this blog before, you know I favor simple cooking methods. Frying just doesn’t seem simple to this Northern girl, though I admit that this is probably just lack of familiarity with the technique. Luckily, I remembered seeing a recipe for doughnuts in a waffle iron cookbook, so I went for it. You can find the original recipe for the sour cream doughnuts here at the Handle the Heat blog. The original recipe only uses egg yolks. I found that the dough wasn’t wet enough to get all of my dry ingredients incorporated, so I added some of the egg whites. However, I didn’t read the instructions closely enough at the beginning (rushing to finish during the kids’ nap time will do that) and whisked the sugar in with the dry ingredients instead of creaming it with the butter. This (and the fact that I used all-purpose flour instead of cake flour) may account for the dryness. Therefore, don’t add the whites until you see how your dough turns out. I also didn’t let the dough rest for an hour (once again, nap time). Once your dough has a sticky texture with a consistency somewhere between cookie dough and a thick cake batter, roll it into golf ball-sized rounds. Heat your waffle iron then coat lightly with cooking spray. Place one ball in the middle of each section. This will create diamond-shaped doughnuts that are slightly smaller than Eggo waffles. Close the iron and allow to cook for the preset time. Remove to a cooling rack and repeat. These were best hot off the waffle iron because they have a crispness on the outside that goes away as they cool. They crisp up nicely when reheated in a toaster, though. I broke mine into pieces and tried various toppings: a dusting of powdered sugar, store-bought icing, peanut butter, and plain. My favorite was the powdered sugar. It added just the right amount of sweetness and paired great with my afternoon coffee pick-me-up. The touch of nutmeg in the dough (I opted for 1/4 teaspoon) made these wonuts (doffles?) great plain, too. So are these as good as traditionally fried and glazed sour cream doughnuts? No, the waffle iron smashes out some fluffiness, but they are easier, taste good, and contain less fat. I will definitely make these again.